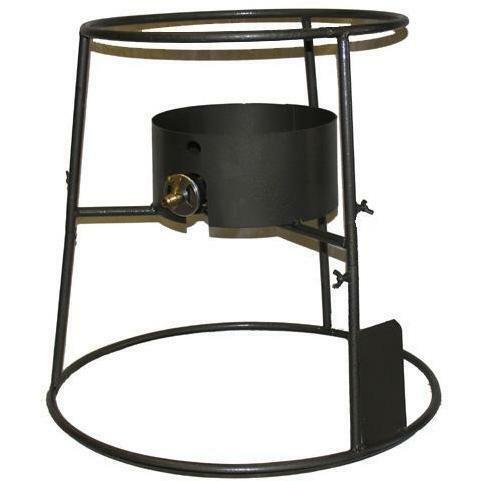 Product Description: Cajun Cookware 5-Gallon Jambalaya Pot Stand With Propane Gas Burner - GL10442A-5 GL610. This Cajun Cookware stand is perfect for jambalaya pots and also holds the gas burner. This Cajun Cookware jambalaya pot stand eliminates the need for a separate burner stand, and the issue of bottom clearance for the burner itself! Burner is included, 35,000 BTUs, 3/8 inch flared fitting - For use with LP Fuel only. The Cajun Cookware stand measures 20. 5 inches tall, approximately 15. 75 Inner Diameter on the top, and the base is about 22 inches in diameter. This Cajun Cookware jambalaya stand fits our 5-gallon jambalaya pot.